Tennis elbow is an inflammation of several structures of the elbow. These include muscles, tendons, bursa, periosteum, and epicondyle (bony projections on the outside and inside of the elbow, where muscles of the forearm attach to the bone of the upper arm). The classic tennis elbow is caused by repeated forceful contractions of wrist muscles located on the outer forearm. The stress, created at a common muscle origin, causes microscopic tears leading to inflammation. This is a relatively small surface area located at the outer portion of the elbow (the lateral epicondyle). Medial tennis elbow, or medial epicondylitis, is caused by forceful, repetitive contractions from muscles located on the inside of the forearm. All of the forearm muscles are involved in tennis serves, when combined motions of the elbow and wrist are employed. This overuse injury is common between ages 20 and 40. People at risk for tennis elbow are those in occupations that require strenuous or repetitive forearm movement. Such jobs include mechanics or carpentry. Sport activities that require individuals to twist the hand, wrist, and forearm, such as tennis, throwing a ball, bowling, golfing, and skiing, can cause tennis elbow. Individuals in poor physical condition who are exposed to repetitive wrist and forearm movements for long periods of time may be prone to tennis elbow. This condition is also called epicondylitis, lateral epicondylitis, medial epicondylitis, or golfer's elbow, where pain is present at the inside epicondyle. Tennis elbow pain originates from a partial tear of the tendon and the attached covering of the bone. It is caused by chronic stress on tissues attaching forearm muscles known as extensor muscles to the elbow area. Individuals experiencing tennis elbow may complain of pain and tenderness over either of the two epicondyles. This pain increases with gripping or rotation of the wrist and forearm. If the condition becomes longstanding and chronic, a decrease in grip strength can develop. Diagnosis of tennis elbow includes the individual observation and recall of symptoms, a thorough medical history, and physical examination by a physician. Diagnostic testing is usually not necessary unless there may be evidence of nerve involvement from underlying causes. X rays are usually always negative because the condition is primarily soft tissue in nature, in contrast to a disorder of the bones. However, magnetic resonance imaging (MRI) has been shown to be helpful in diagnosing cases of early tennis elbow because it can detect evidence of swelling and tissue tears in the common extensor muscle group. Heat or ice is helpful in relieving tennis elbow pain. Once acute symptoms have subsided, heat treatments are used to increase blood circulation and promote healing. The physician may recommend physical therapy to apply diathermy or ultrasound to the inflamed site. These are two common modalities used to increase the temperature of the tissues in order to address both pain and inflammation. Occasionally, a tennis elbow splint or taping may be useful to help decrease stress on the elbow throughout daily activities. Exercises become very important to improve flexibility to all forearm muscles, and will aid in decreasing muscle and tendon tightness that has been creating excessive pull at the common attachment of the epicondyle. The physician may also prescribe nonsteroidal anti-inflammatory drugs (NSAIDS) to reduce inflammation and pain. Injections of cortisone or anesthetics are often used if physical therapy is ineffective. Cortisone reduces inflammation, and anesthetics temporarily relieve pain. Physicians are cautious regarding an excessive number of injections as they have been found to weaken the tendon's integrity. In addition, a significant number of patients experience a temporary increase in pain following corticosteroid injections. A newer method of treatment for tennis elbow is shock wave therapy, in which pulses of high-pressure sound are directed at the injured part of the tendon. The "shock" refers to the high pressure, which breaks down scar tissue and stimulates the regrowth of blood vessels in healthy tissue. Shock wave therapy sessions take about 20 minutes and have been reported to have a success rate of 80%. Shock wave therapy has very few side effects; one group of German physicians found that temporary reddening of the skin or small bruises were the most commonly reported side effects. Botulinum toxin, or Botox, is also being tried as a treatment for tennis elbow as of late 2003. Although further research needs to be done, Botox appears to relieve pain in chronic tennis elbow by relaxing muscles that have gone into spasm from prolonged inflammation. The classic tennis elbow is caused by repeated forceful contractions of wrist muscles located on the outer forearm. The stress created at a common muscle origin causes microscopic tears leading to inflammation. Persons who are most at risk of developing tennis elbow are those whose occupations requires strenuous or repetitive forearm movement. If conservative methods of treatment fail, surgical release of the tendon at the epicondyle may be a necessary form of treatment. However, surgical intervention is relatively rare. Massage therapy has been found to be beneficial if symptoms are mild. Massage techniques are based primarily on increasing circulation to promote efficient reduction of inflammation. Manipulation, acupuncture, and acupressure have been used as well. Contrast hydrotherapy (alternating hot and cold water or compresses, three minutes hot, 30 seconds cold, repeated three times, always ending with cold) applied to the elbow can help bring nutrient-rich blood to the joint and carry away waste products. Botanical medicine and homeopathy may also be effective therapies for tennis elbow. For example, cayenne (Capsicum frutescens) ointment or prickly ash (Zanthoxylum americanum) oil applied topically may help to increase blood flow to the affected area and speed healing. Tennis elbow is usually curable; however, if symptoms become chronic, it is not uncommon for treatment to continue for three to six months. Until symptoms of pain and inflammation subside, activities requiring repetitive wrist and forearm motion should be avoided. Once pain decreases to the point that return to activity can begin, the playing of sports, such as tennis, for long periods should not occur until excellent condition returns. Many times, choosing a different size or type of tennis racquet may help. Frequent rest periods are important despite what the wrist and forearm activity may be. Compliance with a stretching and strengthening program is very important in helping prevent recurring symptoms and exacerbation. Altay, T., I. Gunal, and H. Ozturk. "Local Injection Treatment for Lateral Epicondylitis." Clinical Orthopedics 398 (May 2002): 127-130. Das, D., and N. Maffulli. "Surgical Management of Tennis Elbow." Journal of Sports Medicine and Physical Fitness 42 (June 2002): 190-197.
de Seze, M. P., M. de Seze, P. Dehail, et al. "Botulinum Toxin A and Musculoskeletal Pain." [in French] Annales de réadaptation et de médecine physique 46 (July 2003): 329-332. Haake, M., I. R. Boddeker, T. Decker, et al. "Side-Effects of Extracorporeal Shock Wave Therapy (ESWT) in the Treatment of Tennis Elbow." Archives of Orthopaedic and Trauma Surgery 122 (May 2002): 222-228. Mackay, D., A. Rangan, G. Hide, et al. "The Objective Diagnosis of Early Tennis Elbow by Magnetic Resonance Imaging." Occupational Medicine (London) 53 (August 2003): 309-312. Melikyan, E. Y., E. Shahin, J. Miles, and L. C. Bainbridge. "Extracorporeal Shock-Wave Treatment for Tennis Elbow. A Randomised Double-Blind Study." Journal of Bone and Joint Surgery, British Volume 85 (August 2003): 852-855. Rompe, J. D., M. Buch, L. Gerdesmeyer, et al. "Musculoskeletal Shock Wave Therapy—Current Database of Clinical Research." [in German] Zeitschrift Orthopädische Ihre Grenzgebiet 140 (May-June 2002): 267-274. Smith, A. M., J. A. Castle, and D. S. Ruch. "Arthroscopic Resection of the Common Extensor Origin: Anatomic Considerations." Journal of Shoulder and Elbow Surgery 12 (July-August 2003): 375-379. Walther, M., S. Kirschner, A. Koenig, et al. "Biomechanical Evaluation of Braces Used for the Treatment of Epicondylitis." Journal of Shoulder and Elbow Surgery 11 (May-June 2002): 265-270. Wang, A. A., E. Whitaker, D. T. Hutchinson, and D. A. Coleman. "Pain Levels After Injection of Corticosteroid to Hand and Elbow." American Journal of Orthopedics 32 (August 2003): 383-385. American College of Occupational and Environmental Medicine (ACOEM). 1114 North Arlington Heights Road, Arlington Heights, IL 60004. (847) 818-1800. www.acoem.org. American College of Sports Medicine. P.O. Box 1440, Indianapolis, IN 46206-1440. (317) 637-9200. http://www.acsm.org. Epicondyle — A projection on the surface of a bone; often an area for muscle and tendon attachment. Epicondylitis — A painful and sometimes disabling inflammation of the muscle and surrounding tissues of the elbow caused by repeated stress and strain on the forearm near the lateral epicondyle of the humerus (arm bone). Extensor muscles — A group of muscles in the forearm that serve to lift or extend the wrist and hand. Tennis elbow results from overuse and inflammation of the tendons that attach these muscles to the outside of the elbow. Periosteum — A fibrous vascular membrane that covers bones. Shock wave therapy — A method of treating tennis elbow and other musculoskeletal injuries that involves directing bursts of high-pressure sound waves at the affected area. 1. the bend of the upper limb; the area around the joint connecting the arm and forearm; see also elbow joint. Called also cubitus. The elbow joint connects the large bone of the upper arm, the humerus, with the two smaller bones of the lower arm, the radius and ulna. It is one of the body's more versatile joints, with a combined hinge and rotating action allowing the arm to bend and the hand to make a half turn. The flexibility of the elbow and shoulder joints together permits a nearly infinite variety of hand movements. The action of the elbow is controlled primarily by the biceps and the triceps muscles. When the biceps contracts, the arm bends at the elbow. When the triceps contracts, the arm straightens. In each action, the opposite muscle exerts a degree of opposing tension, moderating the movement so that it is smooth and even instead of sudden and jerky. As in other joints, the ends of the bones meeting at the elbow have a smooth covering of cartilage that minimizes friction when the joint is moved. 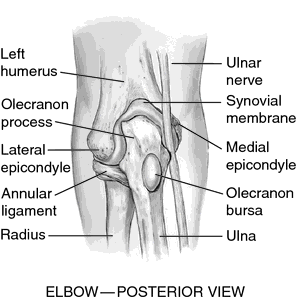 The elbow joint is lubricated with synovia, and its movement is eased by the bursa, a small sac of connective tissue. The bones forming the joint are held together by tough, fibrous ligaments. The “funny bone” is not a bone but the ulnar nerve, a vulnerable and sensitive nerve lying close to the surface near the point of the elbow. Hitting it causes a tingling pain or sensation that may be felt all the way to the fingers. Disorders of the Elbow. The elbows, like the knees, are continually exposed to bumps, twists, and wrenches. Elbow injuries include fracture of a bone near the joint, dislocation, and tearing of tendons and ligaments. Dislocation and fracture may occur together. arthritis may affect the elbow and make it stiff or impossible to move. Special exercises, manipulation, and heat therapy may be prescribed to help restore flexibility. bursitis can also cause pain in the elbow, often as a result of excessive use of the joint. tennis elbow a term often used for bursitis of the elbow but more accurately referring to tendinitis felt in the outer aspect of the elbow due to inflammation of the extensor tendon attached to the lateral humeral condyle. Rest and heat therapy usually relieve it. It affects both tennis players and others who put stress on the elbow. chronic inflammation at the origin of the extensor muscles of the forearm from the lateral epicondyle of the humerus, as a result of unusual or repetitive strain (not necessarily from playing tennis). A painful inflammation of the tissue surrounding the outer side of the elbow, caused by strain from playing tennis and other sports. Tension stress injury to the lateral epicondyle caused by repeated or forceful contraction of the wrist extensors; often seen in those involved in sports that use racquets. Synonym(s): lateral humeral epicondylitis, tennis elbow. Inflammation of the bony prominence on the outer side of the elbow caused by overuse of the forearm muscle whose TENDONS are attached to this point. Treatment involves rest, temporary immobilization, the use of anti-inflammatory drugs and professional advice on playing technique. The condition has been successfully treated with botulinum toxin. bony eminences on the sides of the lower end of the femur and of the humerus, which provide attachment for tendons around the knee and elbow joints. epicondylitis inflammation of the muscles and tendons around the elbow. Can occur if either the lateral (outer) structures or the medial (inner) structures are subjected to excess or repetitive stress. lateral epicondylitis (tennis elbow) is associated with racquet sports and weight training. medial epicondylitis (golfer's elbow, javelin thrower's elbow) an overuse injury associated with poor lifting techniques. Q. Are there any alternative treatments to Tennis Elbow? I've been suffering from Tennis Elbow for over 2 years and would really like to avoid surgery. Any suggestions based on your experience would be highly appreciated. A. Massage therapy has been found to be beneficial if symptoms are mild. Massage techniques are based primarily on increasing circulation to promote efficient reduction of inflammation. Manipulation, acupuncture, and acupressure have been used as well. Contrast hydrotherapy (alternating hot and cold water or compresses, three minutes hot, 30 seconds cold, repeated three times, always ending with cold) applied to the elbow can help bring nutrient-rich blood to the joint and carry away waste products. Botanical medicine and homeopathy may also be effective therapies for tennis elbow. For example, cayenne (Capsicum frutescens) ointment or prickly ash (Zanthoxylum americanum) oil applied topically may help to increase blood flow to the affected area and speed healing. Q. I am suffering from tennis elbow for nearly three months. What is the best treatment and exercise? There is very pain and I can not lift any weight even mug to bath. I attended my doctor who advised me Nucoxia 90 (Etoricoxib 90) 1 OD for 14 days and SWD 10 minutes for 6 days at affected right elbow. There was some relief for few days but again the position is same due to which I am unable to do my routine works. At night on sleeping, the arm becomes heavy and painful. A. As for i have learned that Tennis elbow is the inflamation of the tendons on the lateral side of the elbow. You can take an ice cube and gently massage it for about 10 minutes and repeat the same for 3 times a week. if you approach a physical therapist , that would be useful where they use a modality called ultrasound with some medication. A physical therapist can teach you how to do correct exercise.